EW.com (ENTERTAINMENT WEEKLY’s electronic edition) reveals the official cover for MOBY (aka WRITTEN IN MY OWN HEART’S BLOOD). Here’s the link to their piece, which has a few questions and answers (such as they are [cough]). While I originally wanted an octopus on the cover–both because I really like octopuses and because of the symbolism (there are eight major characters whose stories I’m telling through this book–and it _is_ the eighth book, after all), there were certain technical issues that made that difficult. My husband–never a big fan of the octopus concept–asked whether I could think laterally; surely there were other ways to get an “8″ onto the cover. So I thought. And almost at once, the word “octothorpe” sprang to mind. I’ve always liked the word, and it certainly was appropriate (you may or may not recognize it in its Very Artistic form here–but it’s the lowly hashtag, or pound sign), as it not only has eight points (and eight “fields” of empty space surrounding it; one explanation of its origin is that it was a symbol on old English land documents for a farm surrounded by eight fields), but is a printing character–and the content of the book does indeed have a certain amount about the printer’s trade in colonial America during the Revolution. So I went at once to Google and typed in “octothorpe”–and pretty much the first thing I saw was this. I was so ravished by Conrad Altmann’s beautiful octothorpe that I emailed it at once to my editor, with the suggestion that we use _this_ for the central icon of the new cover design. Now, frankly, the Art Department was so relieved not to have to deal with any more octopuses that I’m sure they would have fallen on any alternate suggestion with cries of gladness. However, they were as pleased with this lovely octothorpe as I was, and came up with this elegant and striking concept, which I Really Like. Hope you will, too! Great Cover! I love the octothorpe. My library patrons are already asking me to put holds on MOBY for them….they don’t seem to understand the book needs to be published first to be able to do that! I can’t wait to get my hands on it. Haha! You think so far OUT of the box, that is why we love your books! The symbol for eight turned sideways is for eternity and is my very favorite number, which coincides with you being my most favorite author. Lovely! Cover – good concept. Looking forward to contents within! Diana – have you by chance seen the article in Smithsonian Magazine on the Lilliputian coffins discovered around 1836 by a group of boys at a rock formation known as Arthur’s Seat? There were 17 of these tiny coffins with miniature wooden figures all dressed in different garb. They are only around 3 inches long. When they were discovered they ended up in a collection of a local Edinburg jeweler named Robert Frazier. They are presently in the Edinburg Museum. There are several interesting explanations of what they are and why they were buried. Thought you might find it interesting. Especially since they could be from the 1780′s. Can’t wait for the new book! I just finished reading ALL seven (7) of the Outlander series books back to back. I can’t wait until WIMOHB comes out and I have already pre-ordered through Amazon. I know that all will be revealed and all the questions from the end of An Echo In the Bone will be answered – I have faith, although my eyes are now worse for wear! Thanks for such a great series. I find myself wandering around wanting to read more of Jamie and Claire, etc… Guess I’ll have to wait. Love the “notice to fan-fiction writers”. You go girl. You are extraordinary! I should say I am not a writer and can hardly put two words together, but I think you are the cat’s meow. I am amazed at your gift. I was just on the Goodreads site, looking at their giveaways in Historical Fiction. There’s a book there, release date is May 1st, called The Roots of Betrayal by James Forrester. The cover of the book looks very similar to MOBY. Congratulations with your latest cover. It’s beautiful. & wish you all a nice weekend. Just wanted to say a big Thank you for working so hard on MOBY, keeping everyone informed as to what is happening on Facebook (which I always look forward to reading every morning), and also for letting your radiant sunshine come through with the wonderful pictures you share. 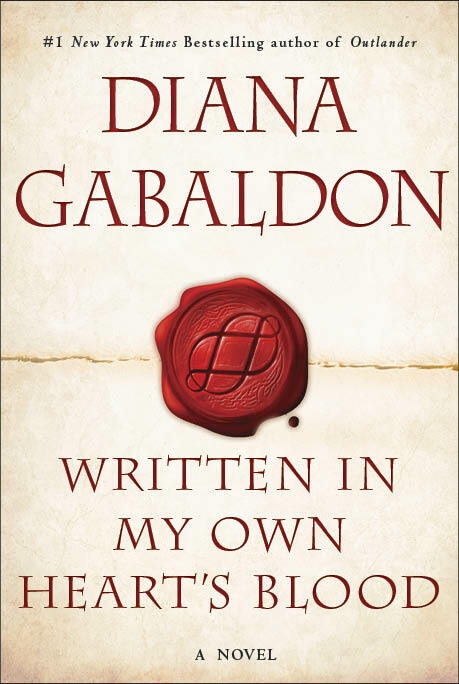 All I have to do is read a little bit everynight – it doesn’t matter which book you have written – as long as I can touch base in the Outlander Series, I am good to go. There are so many strange things happening in the world today and so much technology that it is so nice to go back in time and see just how it was before all the modern conveniences came about. That seems so strange to say, although, that is what it boils down to. Thank you again for sharing such a great story. Dr. Gabaldon: Such a treat to hear the new book has a wrapper! Loving all the symbolism and the elegant wax seal with the octothorpe. I’ve gifted my very best friends with copies of Outlander to get them addicted to Jamie and Claire in the last year, so they can wait and suffer with me for the Eighth! Thank you for what you do in such an elegant way. Your audiotapes got me and my husband through 13 long medical journeys to have eye surgeries, corrections to same, and then a very risky series of fixes to a collapsed lens that ended well, Thank Jesus, but your words made those approximately 10,000 miles of anxious travel go so much more quickly and well. Your narrator/storyteller is enchanting, we enjoy her so much, and pick up so many small delicious details that we may have missed upon first reading. Incidentally, though a voracious reader all my life, I only heard of your books through a cyber group of Crazy Quilters International, who are exceptionally well read and started a round robin of quilt blocks on the theme of “Outlander”. There was some pretty nice Crazy Quilt Art made in your characters honor. Is there a website where we can view these quilts?? I love all your “Outlander” series. So glad you are writing an eithth book. There was a lot of loose end left. You are a great story teller. Love your “Outlander” series. Looking forward to the 8th book. Echo In The Bone left a lot of loose ends. Can’t wait to read it. My very close friend, Erika is a HUGE fan of your work. She is DYING of 4 brain tumors. She was very tearful to learn the next outlander book is due out in Dec 2013. She will not be here by then. My heartfelt HOPE is that you could send us the book early. She is an amazing strong women, mother, wife and friend. This small favor would mean a whole lot. I feel so sad to think that when the book hits the sheelves we will not have her. Please consider… Thanks – I’m a fan also becuase of Erika!! I’m so sorry to hear about your friend’s illness. I’m afraid it’s not a matter of my consideration, though; I’m not finished writing the book; it doesn’t exist yet. I’ll add Erika to my prayers; she’s lucky to have a caring friend like you. Love the cover. I think this one is better than your octopus was. I am chomping at the bit. I learned more about my own U.S. History than I did whenI was in High School. Probably because I was young and just wanted out of school. being half irish and half scottish, it made me understand just how much they gave for freedom, even after their slaughter and being forced to the colonies. Oh gosh! I can’t wait for this book, but am frankly a bit nervous! I started reading the Outlander series on a family vacation during Spring Break in March. I have devoured each book, unable to stop reading. My family thinks I am obsessed! Book seven, An Echo in the Bone, however, was so disappointing. I found the book too complicated, with excessive story lines to follow. I cannot begin to express my devastation that Claire and Lord John slept together. No!! Having them marry was somewhat understandable, although I think a forced point in the plot. How will Claire and Jamie ever get past that?! I’m hopeful that book eight will return to the heart of the series, and make things right for Claire and Jamie. Well, readers’ responses to a book are all different, because the readers are all different. I think you’ll enjoy WRITTEN IN MY OWN HEART’S BLOOD, though. I am one of those who have anxiously awaited any information (via blog, twitter, etc.) and an avid reader of all. I have never been entranced by stalking anyone, but I suppose now that I describe it, I have been a quiet net-stalker (in a totally non-creepy way) for over a year now. I am incredibly excited about the new cover, the thought behind it, the symbolism, and the meaning. I have always appreciated your work due to the fact that it can never be considered shallow because of all the depth, the hidden messages, and the social and historical conundrums it reveals if your readers really take it all in. I appreciate your hard work! As all of your readers, I am disappointed to have to wait until DECEMBER *gasp*. I am currently pregnant and home-bound after a much-needed surgery that they couldn’t wait for until the birth of my 2nd son… and I thought, “Wow, maybe the 8th one will be out during my confinement!” Alas, it will not be, but it will not deter me from confining myself to my bed at some point during December (probably winter break, as I am a school teacher) and barring the doors until I finish this installment. Thank you SO much for this lovely series of books. Jamie and Claire are like friends to me. I can’t tell you the number of people I’ve introduced to your Outlander series! They’re hooked! It is so enjoyable to read and re-read your books. Thanks for the joy, laughter, and tears. Octopus is better. I too love them – tremendously smart creatures. Perhaps your husband doesn’t know enough about them. Elsewise how could he not love them? If all else fails get new husband. Or maybe a new time. Impatiently waiting for new book.